This is book 2 in the White Cliff Bay series by Holly Martin, following on from Christmas at Lilac Cottage. Like the first in the series, the action takes place around Christmas time, but as I'm a sucker for anything Christmassy I don't mind reading something festive at any time of year. White Cliff Bay caught my imagination in the first book, so I was looking forward to returning. This tale basically follows the relationships of two couples - the main characters Libby and George, and also Seb and Amy. Libby is a relative newcomer to White Cliff Bay and lives next door to George. She is not planning to stay for long, but is enjoying her time there. The others are all long-time residents of the town. There are of course lots of other players in the story, some of whom I remembered from the previous book. Holly Martin has once again written an appealing story which grabs the attention from page one and holds it right to the last page. There was some wonderful humour in this story that had me laughing out loud several times. George's antics as he tries to sort out his love life are at times priceless. He is also mad about Christmas and I loved that he filled his flat and his life with Christmas decorations and customs. Author Libby could be almost equally as zany as him. Seb and Amy's relationship was far more serious and they had to deal with many obstacles that were threatening to come between them. However, some of Amy's costumes she was asked to wear for promotions run by the charity she helped out led to a great deal of mirth as well. 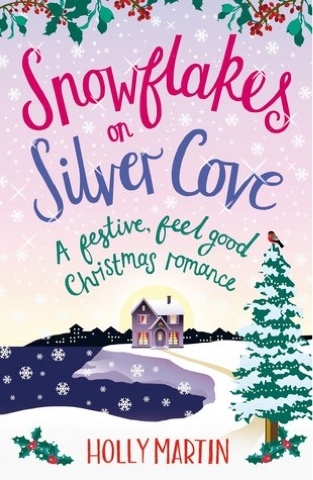 Once agin, this story had me wishing I could go and visit the lovely seaside town of White Cliff Bay and the beach at Silver Cove. The setting and the inhabitants were brought to life so skilfully by Holly. I am really looking forward to the next in the series.